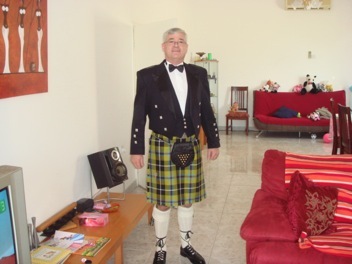 This page is about your kilt photos and as such it will feature photos sent to me by you, the visitors to this web site. 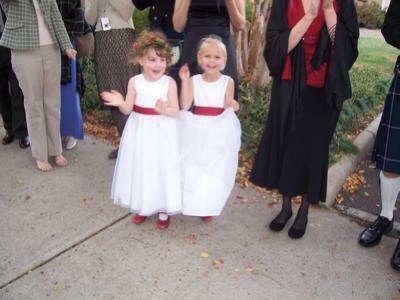 I would like to open the page with some photos kindly sent to me by Bill, who first got in touch through the "Contact Us" page on the web site. He had a wedding coming up and wanted to surprise the Bride and Groom by wearing Highland Dress, never having done such a thing before he was in need of a little advice, which I gladly gave him. The first photo you see below is Bill proudly wearing his Highland Dress for the first time, and doesn't he look handsome. Next is Bill and his lady wife. We now have the Bride and Groom, the Groom is a member of a pipe band and looks resplendent in his uniform. 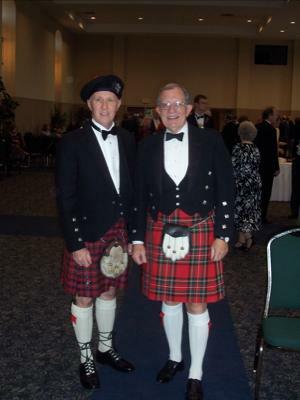 Then bill once again with another wedding guest in full Highland Dress. Although there are no kilts in this next photo I couldn't resist including it, and I think you will understand why they're so cute aren't they. In the last of your kilt photos for this section, you can see how a ladies tartan skirt can look really elegant, and when the tartan matches the kilt as in this case then they compliment each other beautifully. I hope you have enjoyed Bill's contribution to the your kilt photos page, I am very grateful to him for having taken the time to send me the photos. I also wish to thank everyone whose photos were sent, for their kind permission to use them on this page. The next contribution to this page (Jan 2009) comes from Carol and David, who have just come back from a cruise to Mexico. They were kind enough to send me a photo which you can see below, taken on board ship during the first formal evening of the cruise. 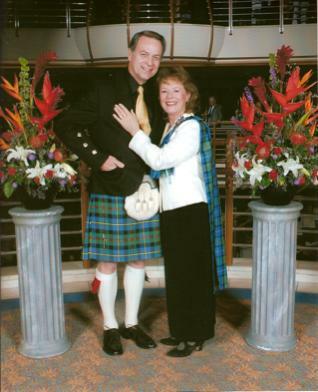 As you can see from the photo, they both look resplendent in Highland Dress, and are clearly enjoying their cruise. The next photo was sent to me (Feb 09) by Rob, who although doesn't as yet own a kilt, he very proudly wears his "country cap" in his family tartan (Rattray) and I felt it is deserving of a place on the your kilt photos page. Rob has a keen interest in genealogy and although born in Australia he has been able to trace his roots as far back as 1796, when his great great great grandfather was born in Scotland. His grandfather migrated to Australia in 1913, and Rob is very proud of his Scottish heritage. Many thanks to Rob for taking the time to send me the photo. The latest your kilt photos were very kindly sent by Colin Langeveld, a South African who has lived in Liverpool for the last 52 years. Colin has also submitted an excellent article to the website detailing how he came to own his cherished kilt, you can read the article here. The Lord Mayor of Liverpool invited people to nominate someone to become an "Honorary Scouser", so Colin's good lady wife, without his knowledge did just that. Colin was chosen to be one of forty five "outsiders" to receive the award. 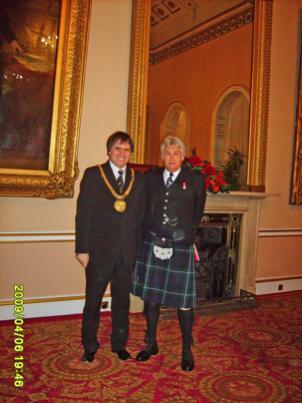 Below you can see a photo of Colin resplendent in his kilt, taken with the Lord Mayor on the evening of the award ceremony. The next photo is of Colin and his good lady wife Jo. It was also taken at the Town Hall on the evening of the award ceremony. Many congratulations to Colin for being awarded the status of "honorary Scouser", and again my thanks to Colin for sending in the excellent photos. 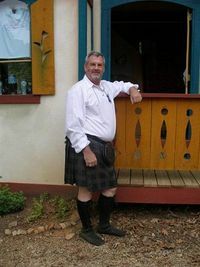 The newest addition to the your kilt photos page (June 2009) has been kindly sent to me by John from America. The photo which you can see below was taken at a local Renaissance fair, which John was attending. John informs me that he intends to increase his kilt collection by the end of the summer, and then again by the end of the year. So I hope he will be kind enough to send in some more photos to the your kilt photos page, of himself wearing the new kilts. The latest addition to the page (August 2009) has been sent to me by Jean Michel, who is a true lover of the great Highland bagpipes. He is a Breton who's Celtic roots go back hundreds of years, he lives and plays the great Highland bagpipes in his native Brittany, and informs me that there are around two thousand pipers playing these particular bagpipes in Brittany. He has also submitted an article to the site entitled Proudly Kilted in which he explains how he came be playing the great Highland bagpipes. 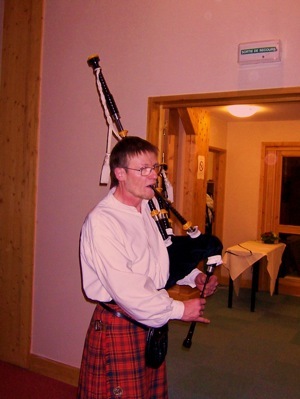 Below you can see a couple of photos of Jean Michel playing the pipes at a Burns Night celebration in Chamonix france. 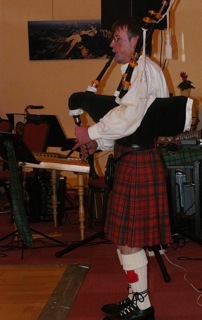 Many thanks to Jean Michel for his valuable contribution, and his love of the Great Highland bagpipes. 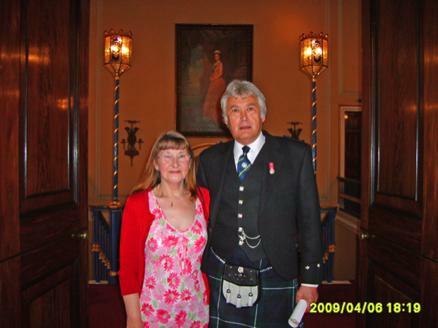 The latest photo to be added to the page (September 2009) has been kindly sent by Taber, who has just recently returned home to the States after he and his wife Beth spent an exciting holiday touring Scotland. 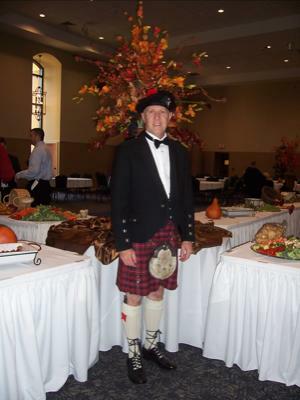 Taber is now the proud owner of an antique Gordon kilt, which you can see him wearing in the photo below. I am sure you will agree with me that he looks very elegant in his Highland Dress, and I'm equally sure that he will find many occasions at which to wear his kilt. 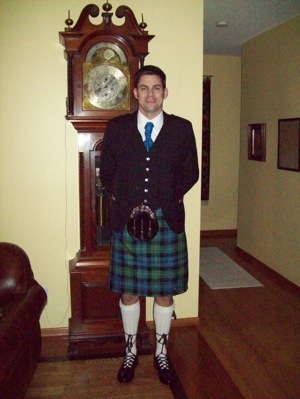 Thank you Taber for taking the time to send me your contribution to the your kilt photos page. The latest photos to update the page (October 2009) have been sent in by Robert from Brizon, France. 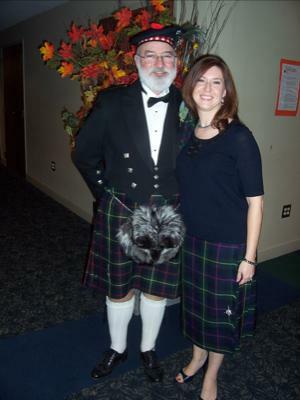 He is also a very fortunate man indeed, as his lady wife actually makes his kilts. 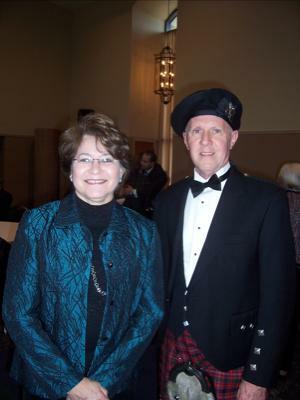 He was kind enough to submit an article to the site, explaining how his wife came to be a kilt maker, he even entitled it she made me a most fortunate man. Below you can see a photo of Robert and his family attending a tartan day celebration in Normandy France. 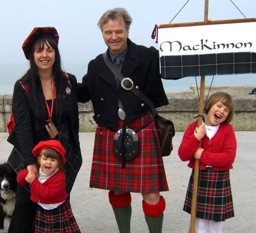 The kilt Robert is wearing is a MacKinnon red modern, double box pleated, made by his wife. The next photo shows him wearing another of his wife's creations, a 22oz tweed double box pleated kilt, ideal for cutting wood for the winter. 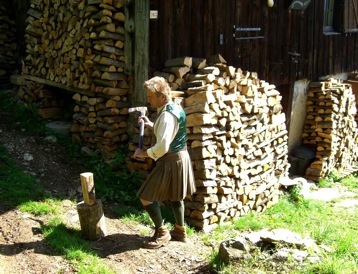 Robert reliably informs me that this particular kilt is both weather proof, and axe proof. I would like to thank Robert, and his lady wife for their valuable contribution to this page. Next we have a further update (January 2010) kindly sent to me by Mike, who is a Cornish man living in the United Arab Emirates. I am particularly grateful for these photos, as they are the first Cornish tartans I have had the chance to feature on the web site. 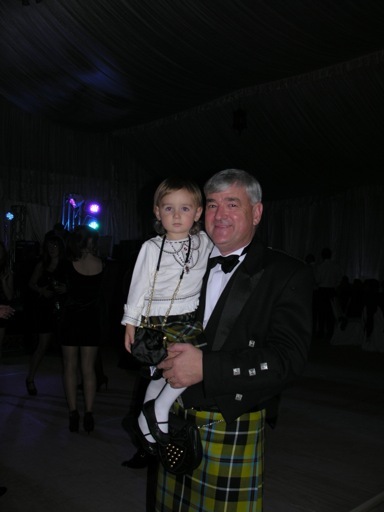 The first photo features Mike and his beautiful daughter Jessica attending a New Year's eve party, both are wearing kilts in the Cornish national tartan. The next photo shows mike trying on his full evening wear in preparation for the New Year's Eve party. 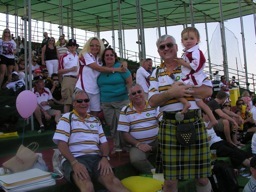 The last photo of Mike on the your kilt photos page, sees him with family and friends attending a rugby match in the United Arab Emirates. He tells me he was amazed how many men were wearing kilts to that rugby match, and that it was a great day out, made all the more special because he was wearing a kilt. If you would like to see more photos of Mike wearing his kilts, including one of him wearing his Cornish hunting tartan, then please go to the Cornish kilts page. I would like to thank Mike for taking the time to send me these wonderful photos, which I'm sure his fellow visitors to the site will enjoy as much as I do. The latest addition to the page (Feb 2010) has been kindly sent to me by Trevor, who first contacted me with a couple of kilt related questions, which I was happy to answer for him. 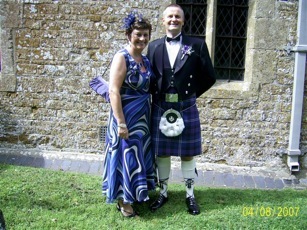 The photo below shows Trevor and his lady wife, attending a wedding in 2007, in Chipping Norton, Oxford, England. This was the first time Trevor had ever worn a kilt, and I must say he carries it off very well. 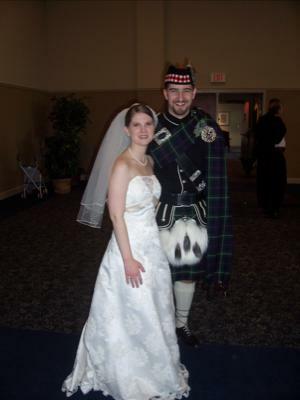 I would like to thank Trevor and his wife, for their permission to feature the photo on the your kilt photos page, and I look forward to receiving more photos from Trevor in the near future. So if you have a digital photo of yourself, or a loved one dressed in the kilt, that you would like to see featured on this web site, please drop me a line using the "contact us" page that you will find at the bottom of the navigation bar. As this page now features quite a few photos, I have begun a new one which you can find at your kilt photos 2 So I invite you to go there now, for some more stunning photos, which have been sent to me by visitors to the web site.